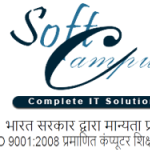 Soft Campus was established on 23-January-2006 to provide COMPUTER EDUCATION & IT Services for learners and support India for maximum computer literacy. It offers various Software, Hardware and professional career oriented courses and focus on the pursuit of excellence in Computer Education, Training and Research. Soft Campus career courses ensure students to learn the skills that make them employable without compromising on quality and fundamentals. Soft Campus Technologies conducts classes in .Net Training, DTP (Desktop Publishing) and PHP. It is located in Bhagalpur, Bhagalpur. It takes Regular Classes- at the Institute.